Religion and Politics in Bahrain: BICI Final Report: What Now? It's grant-deadline season here in Doha, so I won't pretend to have read yet all or much of the BICI's final report. Thanks to many individuals who apparently have, though, there's little reason to stay up at night scanning the entire 500+ pages. In an interview Wednesday, Bahraini Ambassador to the United States Houda Nonoo defended the government’s claims of Iranian involvement. She pointed to Iranian state media provocations and official statements calling Bahrain Iran’s 14th province. Which, even if she didn't know it, is actually a paraphrase of Homer Simpson: "Facts schmacts. You can use facts to prove anything that's even remotely true." Mr. Bassiouni, in a view echoed by American officials, had hoped the report would empower government officials who are perceived as more moderate. But the outcome will depend in large part on the strength of the resistance to the report’s recommendations within the ruling family. In general, then, it seems that the report fell somewhere between the two extreme interpretations offered since the BICI's creation--that its toothless final product would reflect the commission's being altogether co-opted; and that it would be used as a mandate for King Hamad to undertake some much-needed political house-cleaning. The reality seems to more closely approximate the latter, though, to refer again to Anthony Shadid's prescient line quoted above: " the outcome will depend in large part on the strength of the resistance to the report’s recommendations within the ruling family." In other words, senior Ministry of Interior officials--including perhaps Sh. Rashid himself--are guilty either of overseeing systematic abuse and torture, or of extreme administrative negligence. Yet how optimistic should one be that King Hamad is willing and able to go after Sh. Rashid (and by implication his Al Khalifa allies in the Ministry of Defense)? Some indication may be offered by the composition of the post-BICI investigative body, but on this point it is difficult to be optimistic. Similarly, the BICI recommends that Bahrain develop "a national reconciliation program that addresses the grievances of groups which are, or perceive themselves to be, deprived of equal political, social and economic rights and benefits." Which sounds an awful lot like a second round of "National Dialogue," whose first iteration clearly (given the selection of al-Dhaharani as chair as well as the main result of the dialogue: more power to the prime minister) was co-opted by Khalifa bin Salman. So, apart from the existence of a new report that confirms what everyone already knew but does not name names, what has changed since August that makes a second dialogue more likely to result in actual political reform than the first? Has the crown prince really regained enough political standing to restart government-opposition talks? In the end, the reason the BICI report presented such a unique opportunity for the country is that it could help resolve its most debilitating problem, which is internal dissension within the ruling family, a stalemate that continues to preclude any meaningful change. It remains to be seen how far the post-BICI implementation commission will go in undercutting the position of Al Khalifa hawks, but the lack of specific implications tied to individuals will, again, make such an effort a much more difficult one. Indeed, in the very week of the report's release, at least two additional protesters have been killed during demonstrations, both by "runaway" police vehicles. If the state is unable to reign in Bahrain's security forces in the very run-up to a report documenting Bahrain's out-of-control security forces, then should we really change our expectations now? The king can revise or even repeal the country's nebulous Anti-Terrorism Law, for example, but will that really put an end to arbitrary detentions and the arrest of political activists? When Sh. Rashid or other top security officials are retired (or moved to, say, the Ministry of Environment); or when Crown Prince Salman announces a new dialogue initiative with opposition leaders that doesn't include 5,000 participants, I will be the first to acknowledge my mistake. Update: A new commission to study the findings of the commission. Anyone see where this is going? Update 2: A start, anyway: "Bahrain replaces national security chief." What about Sh. Rashid? And evidently the U.S. has not learned its lesson about "interference" in Bahrain's affairs. Expect about 14 op-eds in Al-Watan tomorrow decrying this story about the attempts of an unnamed "U.S. diplomat" to mediate government-opposition talks. Finally, al-Wifaq has rejected participation in the government's post-commission commission, supposedly on grounds that no serious actions had been taken since the release of the report. Perhaps the dismissal of Sh. Khalid bin 'Abdallah was meant as a signal. Update 3: Check that. The national security head was "fired" only in the sense that he was moved to the National Security Council and made special security adviser to the king. The Interior Ministry (along with the GDN) has hailed sweeping "reforms" that include highly progressive measures such as bringing "international experts ... to help develop Bahrain's police force and a code of conduct." As opposed to, say, just making a policy proscribing the use of shotguns against protesters. Finally, in a new interview with Al-Hayat, Bassiouni has called "regrettable" al-Wifaq's rejection to take part in the government's post-commission commission, a line picked up quickly by the BNA. Update 4: Based on his Washington Times op-ed yesterday, former 5th Fleet head Vice Admiral Charles W. Moore clearly has not read the BICI report. Ironically, the Washington Times is the same newspaper that published the article (linked above) on the BICI finding of no Iranian involvement in the Bahrain protest movement. Someone get Moore a copy of the report. Update 5: What he said. Update 6: Instead of giving the opposition a (political) reason to stop protesting, Bahrain seems content in its post-BICI "reforms" to change the way it deals with demonstrators by hiring new Western police advisers. Any change in Bahrain is most likely to be a result of external pressure from the US/UK. 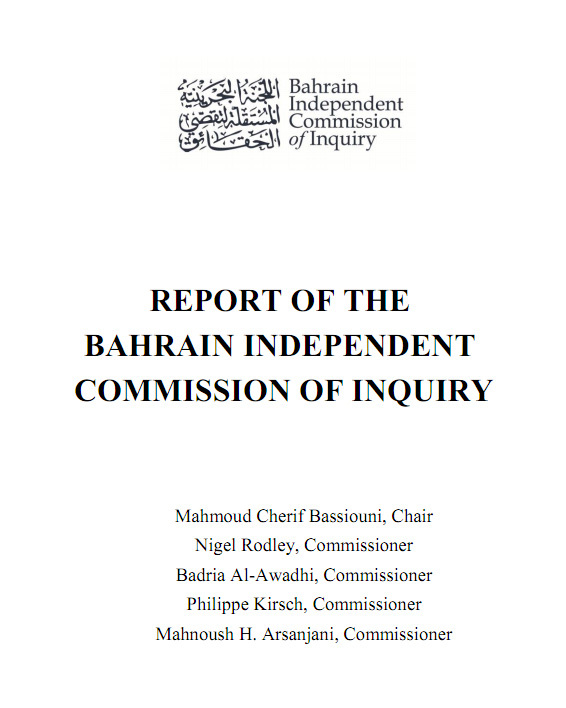 Indeed the report itself was not aimed at Bahrainis, but was meant as tool to show the outside world that the Ruler is an independent party in this conflict. This is obviously not the case. Just another minister stumbling his way trying to defend the government. Just read Moore's op-ed. Unfortunately, I fail to see the part where he presumably states there has been Iranian involvement in the Bahrain uprising. However, what he did was a compelling case for U.S. interests regarding Iran and the necessity for continued close ties with Bahrain. I believe his qualifications as former Commander in the region lend considerable weight towards this assessment. 1) Idealistic: U.S. pursues Democracy at all costs regardless of perceived ill-effects towards National Security including reduced access to not only Bahrain but likely the majority of the Arabian Gulf (at least in the short run and possibly long term). 2) Pragmatic: U.S. and Bahrain focus on their common enemy (Iran) while the U.S. continues to encourage reform through diplomatic processes including easing pressure from GCC neighboring countries. I imagine the final direction taken will lie somewhere between these extremes with the end result being a more reformed Bahrain (torture no longer practiced, increased Shia representation across the entire spectrum of Bahraini society, and far greater freedoms of speech and the press) though falling shore of a fully democratically elected government; while maintaining the long standing relationship (militarily and economically) between the U.S. and Bahrain. "For that reason, President Obama’s administration has been right to resist the calls made by some individuals to remove our support from Bahrain’s government and embrace a protest movement that has legitimate grievances, but is nonetheless being used by Iran for its own nefarious purposes." Saying "no Iranian involvement in the Bahrain protest movement" is not the same as "[the protest movement is] being used by Iran for its own nefarious purposes." Moore was stating that Iran benefits from the unrest in Bahrain. It should also be noted that the BICI report made its finding based on information made available to their investigators which left the door ajar to the possibility of Iranian influence. Considering the recently uncovered Iranian plot to assassinate the Saudi Ambassador to the U.S. from within the U.S., it seems reasonable to conclude Iranian operatives are likely embedded within Bahrain which is a mere 200 miles from the Iranian coast. I think there is a difference between saying "the uprising / protest movement is USEFUL for Iran's purposes," with which I think few would disagree. and saying "the uprising / protest movement is BEING USED for Iran's purposes." The latter implies complicity or at least co-optation on the part of demonstrators themselves. In any case, I think our wildly differing views on the seriousness of the Iranian "plot" to assassinate the Saudi ambassador belie a more general disagreement, which is fine.